– The field of 33 is set for next Sunday’s Indianapolis 500 and Spencer Pigot will be right at the front. Pigot will start on the outside of the second row in his third 500-mile race and first with Ed Carpenter Racing. Pigot’s 6th place qualifying effort is not only the best of his Indianapolis Motor Speedway career, but also the best of his Verizon IndyCar Series career. – A two-day qualifying effort commenced with Bump Day, May 19. On one end of the spectrum, the field was narrowed from 35 entires to 33 starters. On the other end, the fastest nine drivers would be allowed to contend for the coveted first starting position on Pole Day, May 20. Drivers with speeds ranking from 10-33 on Saturday vied for their finalized positions on Sunday, but the real star of the show was the Fast Nine Shootout. The nine drivers in the Fast Nine Shootout would be the only individuals with a shot at the pole for the Indianapolis 500. – Pigot was the first of ECR’s three cars to make a qualification attempt on Saturday after Friday night’s blind draw set the qualification order. He was only the fifth of 35 cars to take to the 2.5-mile oval. Pigot’s laps of 228.231, 228.288, 228.069 and 227.621 gave the 24-year-old a four-lap average of 228.052 miles per hour. At the end of the day, the speed of his No. 21 Preferred Freezer Services Chevrolet was the sixth-fastest of the day, securing him in a spot in the Fast Nine Shootout and giving him his first opportunity to take a shot at an Indianapolis 500 pole position. – Times from Saturday’s Bump Day were erased going into Sunday’s Pole Day qualifications. Drivers in the Fast Nine Shootout were required to make one four-lap attempt, in order based on slowest to fastest from Saturday’s qualifying time. Pigot was the fourth car out on the 2.5-mile oval fourth when the Fast Nine Shootout commenced at 5-5:45 p.m. ET. – In his Pole Day qualification run, Pigot’s four laps boasted speeds of 228.709, 228.005, 227.961 and 227.755 for a four-lap average of 228.108 miles per hour. Pigot will start from the outside of Row 2 in the 6th position, his highest starting position of his Verizon IndyCar Series career. – Ed Carpenter Racing earned the nickname “Team America” in 2015 when ECR was the only multi-car team with an all-American driver line up in the Indianapolis 500. The trend continues through 2018 as Team America’s Indy 500 roster features Pigot (Orlando, Fla.), Danica Patrick (Roscoe, Ill.) and hometown favorite, Ed Carpenter (Indianapolis). All three of Ed Carpenter Racing’s cars reached the Fast Nine Shootout with Patrick qualifying 7th while Carpenter earned his third Indianapolis 500 pole position. – After two seasons as road and street course driver of ECR’s No. 20, Pigot has been elevated to the season-long driver of ECR’s No. 21 for the 2018 season. 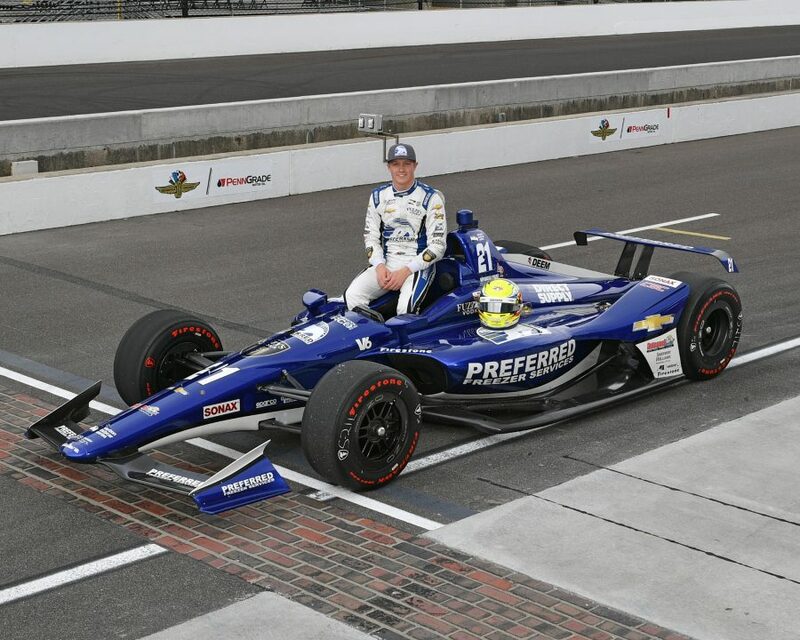 After winning the Indy Lights championship in 2015, Pigot’s rookie Indianapolis 500 was contested with Rahal Letterman Lanigan Racing in 2016 as part of a three-race scholarship. As ECR only entered two cars in 2017, Pigot joined Juncos Racing for last year’s race. In both of his previous attempts, Pigot qualified 29th. His 6th-place starting position for the Indianapolis 500 is the highest of his career, besting his 9th-place starting position from two weeks ago at the INDYCAR Grand Prix. – The 102nd Running of the Indianapolis will commence at 11 a.m. ET on ABC with the green flag scheduled to fall at 12:21 p.m.